Any princess would be happy in this fluffy bed. There is a new bed and bath store in town—finally! 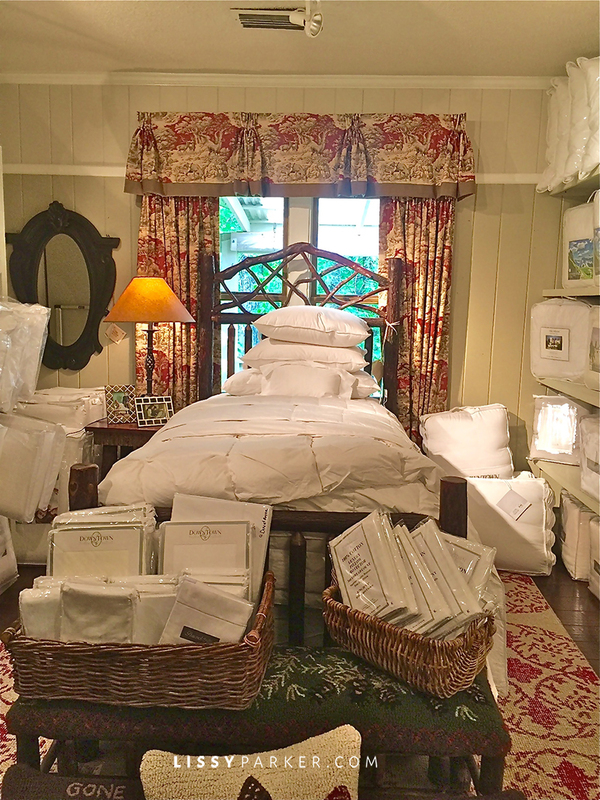 The Summer House in Highlands, North Carolina, has just opened its new addition next door to the furniture and kitchen stores. I have waited for this place to open for months. They have a large selection of almost anything you need for that rustic log cabin or new home. I found a few gifts for friends and some treasures to stock in my guest rooms—you need stocked guest rooms when you live in a resort town. Take a look at the little darlings that caught my eye while I was shopping, and make a trip there to see for yourself. Ask for Natalie—she has amazing taste. Love this blue from Pine Cone Hill! These herringbone blankets are a perfect summer weight. I love the whole collection. They have every bathroom accessory you could need— and I love the baskets. White towels fill an entire wall. A rainbow of color fills the opposite wall. Skinny coconut oil has a large selection to choose from. Beautiful beds fill every room—and look at this cute polka dot pillow! There is a whole new collection from Stamattina. They even carry accessories—in cute colors! Dash & Albert rugs are ready to go. These Prosecco soaps and creams are a favorite. Even more milk soaps—and a great cabinet. Summer House also designs beautiful kitchens. Looks fabu thanks for sharing! What a diverse and gorgeous store!!! So much to shop! Their furniture store right next to the Bed&Bath is top notch! Marianne, I love it all—Natalie is the best.